On Jan. 4, 2011, the moon passed in front of the sun in a partial solar eclipse - as seen from parts of Earth. Here, the joint Japanese-American Hinode satellite captured the same breathtaking event from space. The unique view created what's called an annular solar eclipse. 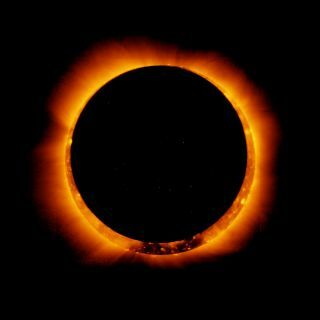 There will be two total lunar eclipses and four partial solar eclipses in 2011. This partial eclipse will be visible at sunrise in northwestern Europe and northwestern Africa, at midday in northeastern Africa and the Middle East, and at sunset in central Asia. This partial eclipse is visible mainly in the high Arctic. This will be an almost central total lunar eclipse. The complete eclipse will be visible in most of Africa, the Middle East, and southern Asia, and parts of the eclipse will be visible throughout Africa, Europe, Asia, and Australia. Maximum eclipse will be at 20:13 UT. This partial eclipse will be visible from southern South Africa, Antarctica, and New Zealand. This total eclipse is well placed for observers in eastern Asia, Australia, and northwestern North America. It is will be visible at moonrise in Africa and Europe, and at moonset in North America. Maximum eclipse will be at 14:32 UT.